Hi. I find many of you prefer to watch videos than to read through blogs, so I’ve put together a three-part series about my trip to New England I hope you will enjoy. 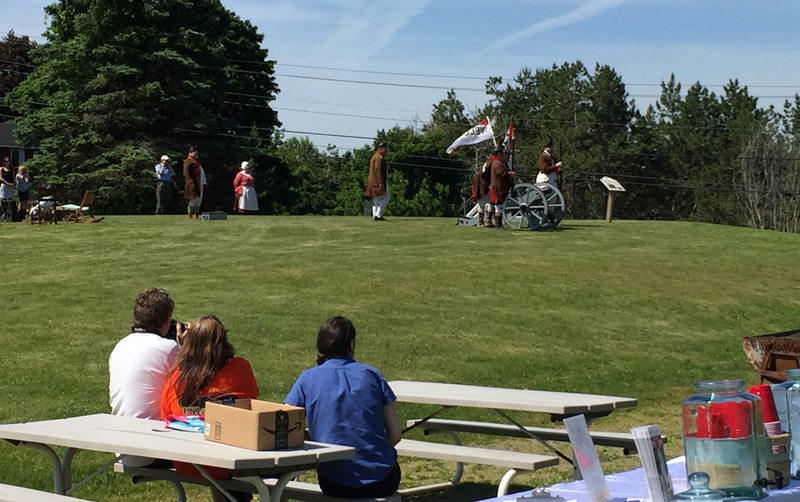 Part I is my visit to Fort Ticonderoga in New York and a snippet of my performance of Henry’s Big Kaboom for the children. Part II starts with finding New York Marker No. 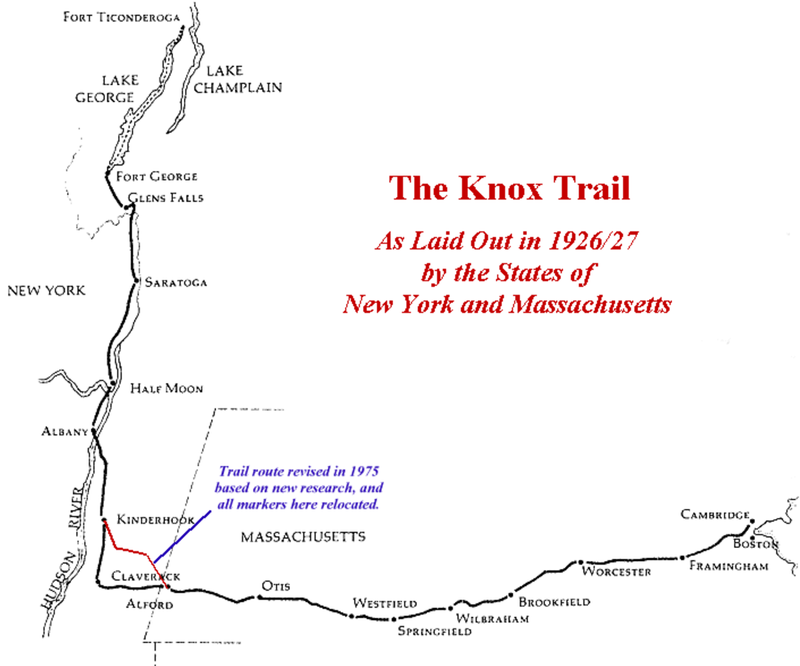 1 of the Henry Knox Trail in Ticonderoga and following the rest of the markers through Albany, over the border into Massachusetts, and on to Westfield. That took three days. I then had to dash to Thomaston, Maine for the ‘Boom’ event. I will finish the trail from Westfield to Cambridge in September when I return to New England for my niece Megan’s wedding. 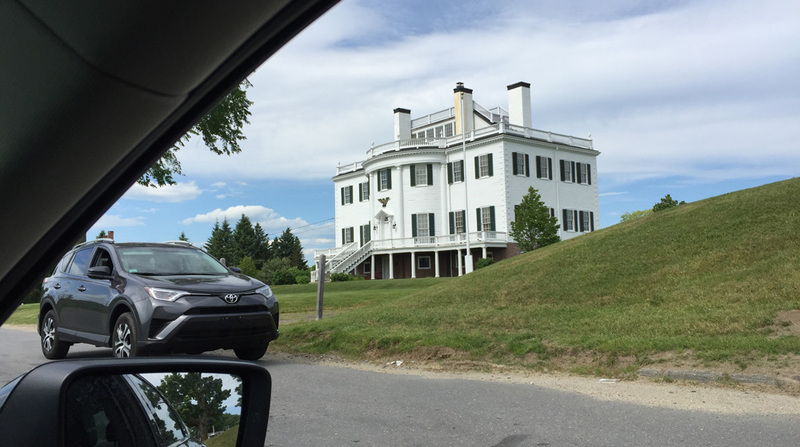 Part III shows my visit to the Henry Knox Museum aka Montpelier. Imagine what it’s like to view a place that, even though a replica of the original, is where your ancestors lived for three generations. As evidenced by the streets named after my 5x-great-grandparents (Knox St, Thatcher St, & Flucker St), they also established the town. I performed my Henry ballad a second time and met third cousins Amy MacDonald and Charles Fletcher (fellow Knox descendants) I’d never met before. Thrilling. After working hard to update our family tree and connect with my family, it was also very emotional. Mary Mitchell singing Henry’s Big Kaboom to children at the Knox Museum in Thomaston, Maine. Cousin Haven Younger served as the official page turner. Important things first. 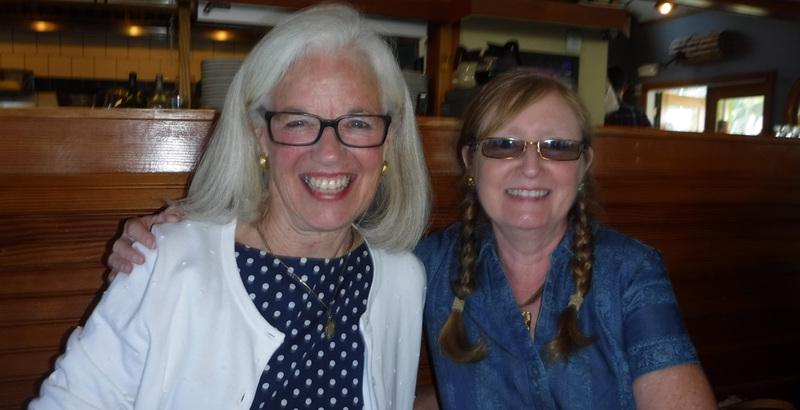 My cousin Haven Younger flew all the way from Napa, California, where she had been vacationing, to Maryland, where she lives, changed suitcases, and, on the next morning, flew to Portland, Maine to join me in Thomaston for the second round of my book signing adventure. I hadn’t seen her in ten years. 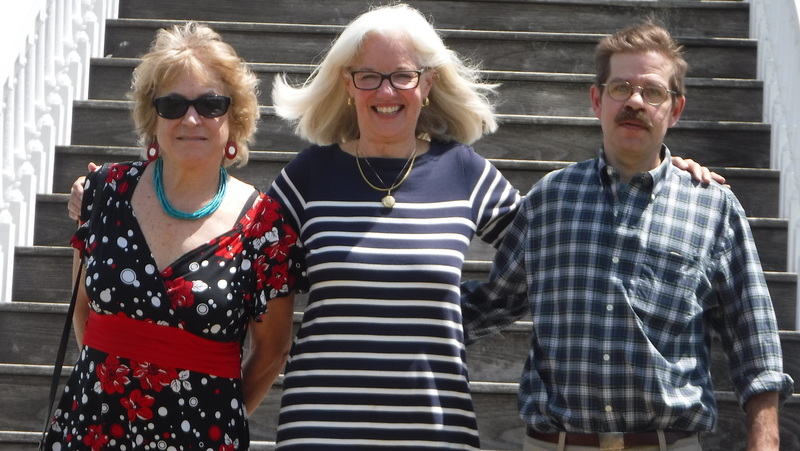 Equally important, third cousins Amy MacDonald and Charles Fletcher, whom I had never met, and only came to know as a result of this genealogical adventure, joined our event from their nearby homes in Maine. Third cousins Amy MacDonald, Mary Mitchell, and Charles Fletcher on the steps of the Henry Knox Museum. 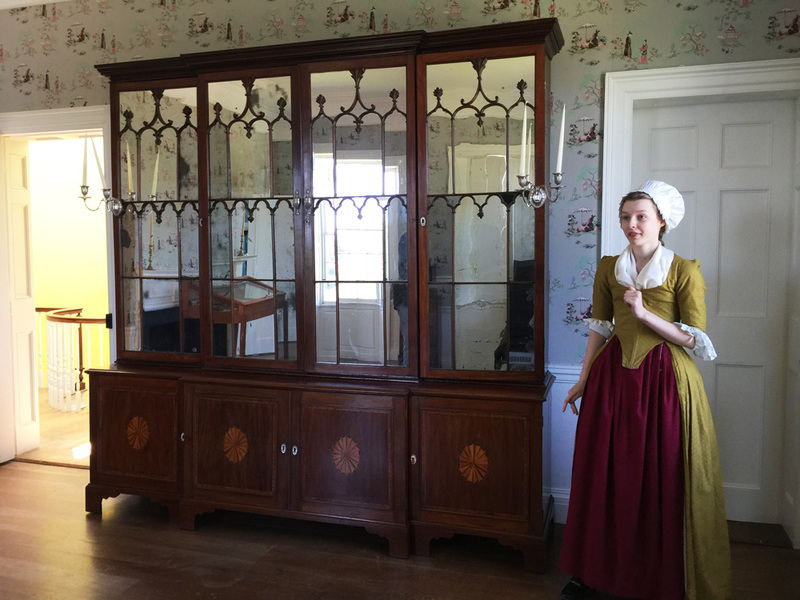 Through my membership in the Daughters of the American Revolution, I found Mary Kay Felton, who is the regent of the Lady Knox Chapter of the DAR as well as a director of the Henry Knox Museum (known as Montpelier) in Thomaston. 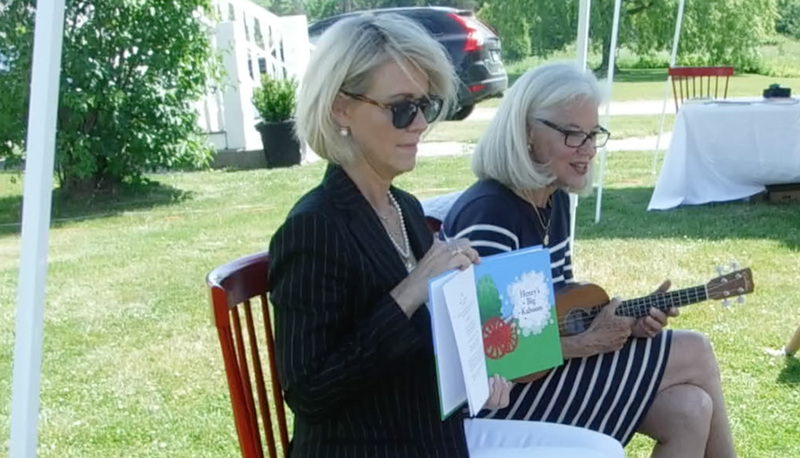 Mary Kay invited me to read/sing my book and have a book signing during the museum’s “Boom” event about Revolutionary War Artillery. Henry’s Big Kaboom fit right into their theme. 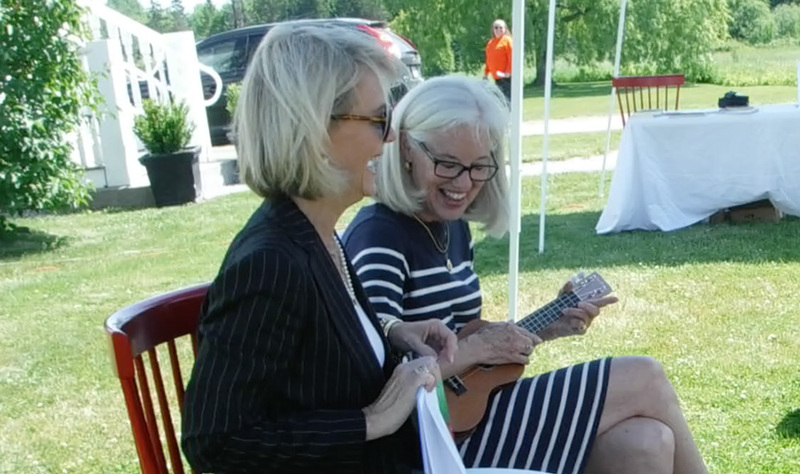 Mary Mitchell and Mary Kay Felton on the eve of the Boom! event at the Henry Knox Museum. Cannon fire demonstration during the Boom! event at the Henry Knox Museum. I had visited the Knox Museum in 2006 when I first learned I was a Knox descendant. I was disappointed that the family tree of Knox descendants that hung on their wall did not include my great-great-grandfather, Charles Gordon Ames. Family tree at the Knox Museum missing Charlie. Charles’ existence was kept a secret for a very long time, especially in the Knox family. When I learned I could launch my book at the Knox Museum, I made it my mission to add Charles Gordon Ames and his descendants to the wall. In the process of updating the family tree (see a previous blog post), I got to know, via emails and phone calls, many third cousins including Amy MacDonald and Charles Fletcher (shown above). Amy MacDonald is also a children’s book author. She brought her books and read two of them. Little Beaver and the Echo and Rachel Fister’s Blister. Amy MacDonald reading Little Beaver and the Echo. Haven Younger helped turn pages again. The museum is a 98% re-creation of the original Montpelier that, until the 1930s, overlooked the St. Georges River in Thomaston. The original was built in 1794. 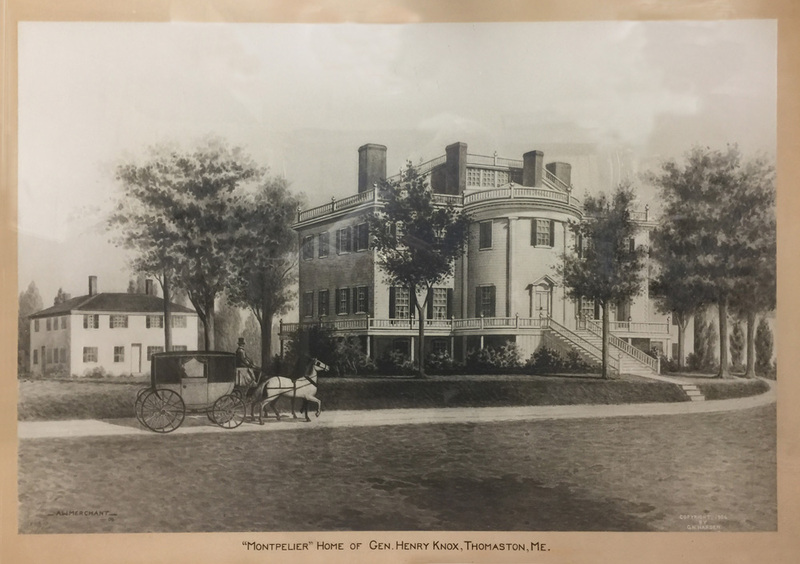 Thomaston has a long colonial history. Montpelier stood where explorer George Waymouth, back in 1605, surveyed the river in search of places for future British colonies. 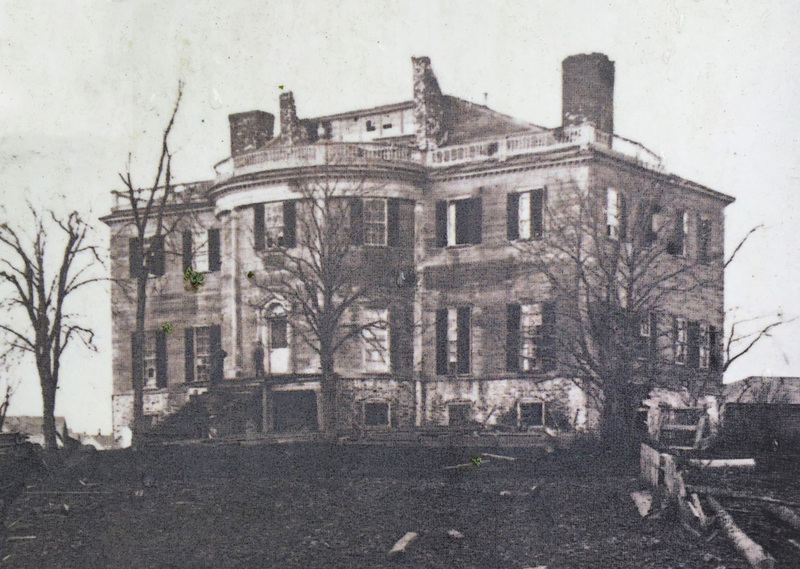 Original mansion built for Major General Henry Knox and his wife Lucy Flucker Knox. When Henry died, his daughter Caroline inherited the estate. When she died, her sister (my 4x-great grandmother) Lucy inherited the estate. She left her son Henry the heir. Henry Knox Thatcher wanted nothing to do with the maintenance nightmare. He sold it and the furniture at auction. The house went to ruin. The Henry Knox Mansion let to ruin. When the railroad was built through Thomaston, the house had disintegrated beyond repair. It and all but one of the nine outhouses, an old brick farmhouse, were torn down. The railroad turned the farmhouse into the Thomaston Train Station. Now it is the Thomaston Historical Society. The society’s director Susan Devlin kindly showed me around even though the building was technically closed in June for repairs. Thomaston Historical Society in what was once an outhouse of the Henry Knox mansion. The land on which the original Montpelier stood had been part of Henry’s wife Lucy’s family’s estate. My 7x great-grandfather Samuel Waldo obtained the Waldo Patent way back in the 1600s. 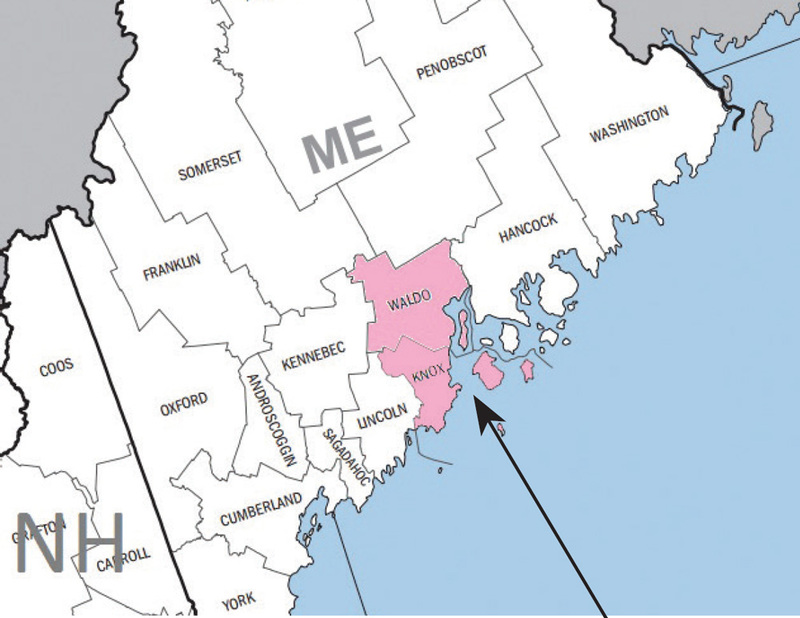 It included today’s Waldo and Knox counties in Maine. 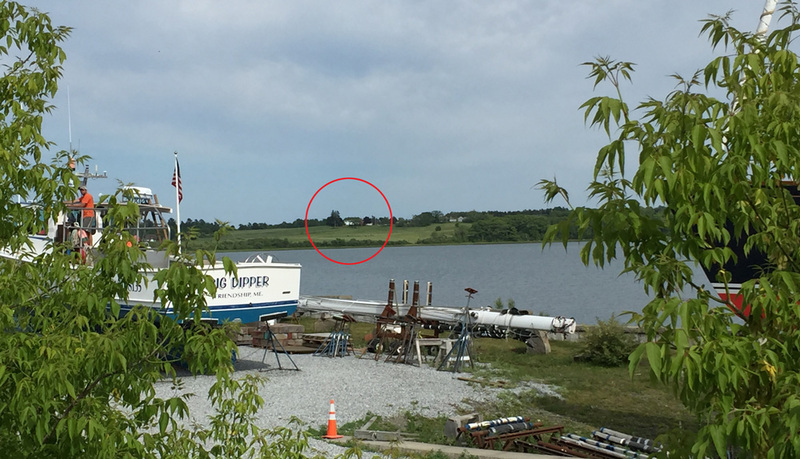 The Waldon Patent included today’s Waldo and Knox counties on Penobscot Bay. 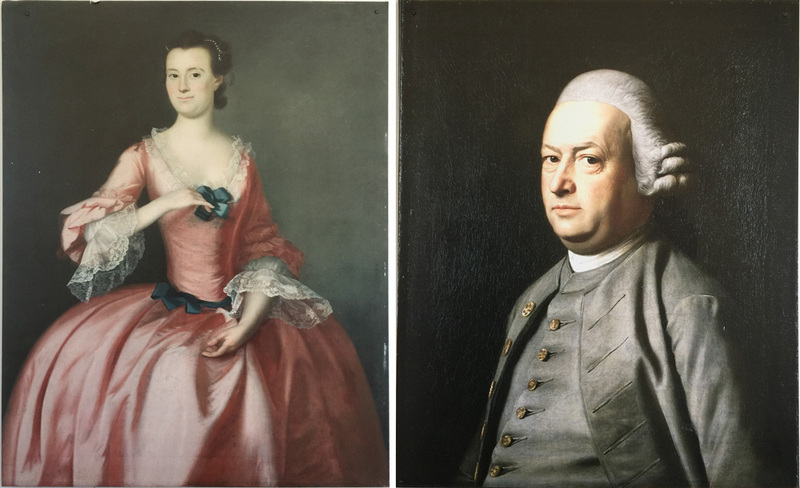 Samuel’s daughter Hannah Waldo married Thomas Flucker – Henry Knox’s in-laws and my 6x-great grandparents. Hannah Waldo Flucker and Thomas Flucker. The Original paintings hang in Boudoin College along with a painting of Hannah’s father, Samuel Waldo. Thomas Flucker was a Tory when revolution broke out in Boston. He served as the Secretary of the Province of Massachusetts. He and Hannah were pretty shaken up when their daughter Lucy fell in love with a rebel. But they did consent to the marriage. When Henry’s guns chased the British out of Boston, Thomas and Hannah sailed to Halifax with the British, never to see their daughter again. They also lost their rights to the Waldo Patent. After the war, Henry was able to work with the US government to obtain the lands back. Then he and Lucy built Montpelier. In the 1930s, the Henry Knox Chapter of the DAR gathered enough money to build the new replica that is now the museum. Today’s Henry Knox Mansion, Montpelier. It is about a quarter mile north of the original. In the next photo, I am standing where the old house was. You can see the museum in the distance. View of the Henry Knox Museum, Montpelier. from the beach that was in front of the old Knox Mansion. Henry Knox’s bed. Lucy had her own room. 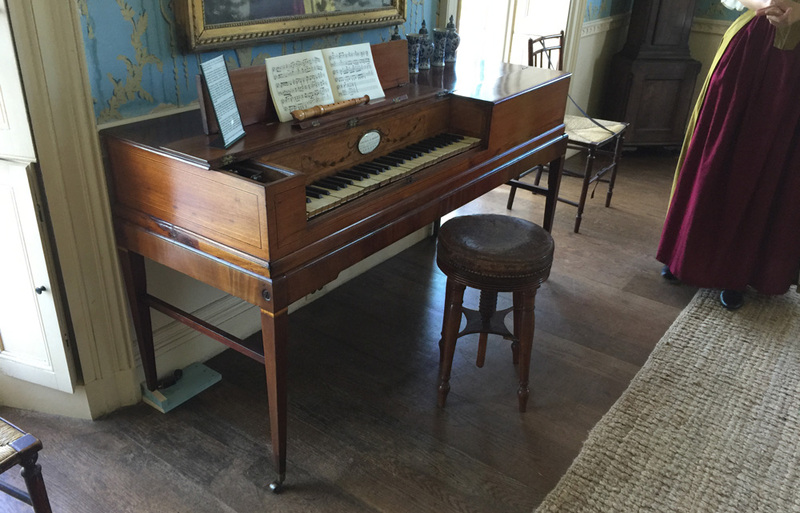 This piano belonged to either Lucy or her sister, Caroline. Either way, my 5x-great-grandmother probably played it. and the oval room. This oval room is one of only two oval rooms built during that era — the other is in the White House. Henry built his first. Even the doors are shaped to fit the perfect oval. The room served as an entryway meant to impress visitors. On the wall is a painting of Henry. Another painting shows George Washington’s first cabinet. Henry was the first Secretary of War. He served with Thomas Jefferson, Alexander Hamilton, Edmond Randolph, and of course, George. 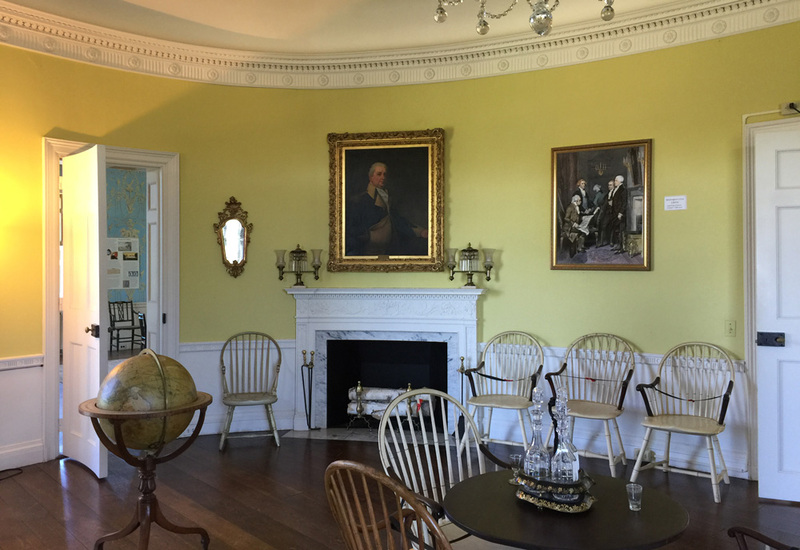 The oval room in the Henry Knox Museum. Among his many talents, Henry was a brilliant engineer. He designed this stairway that is supported only by the arches. 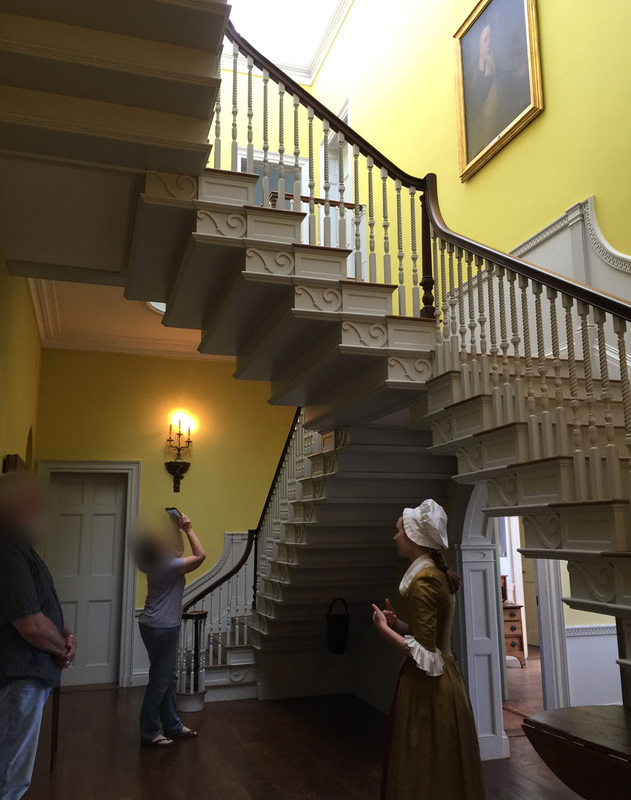 The central stairway in the Henry Knox Museum designed by Henry himself. Just up the road from the museum, Haven and I found the cemetery where Henry and his family are buried. The names of Henry’s wife and children cover the faces of all sides of the monument. Only Henry’s name has been preserved so you can still read it easily. 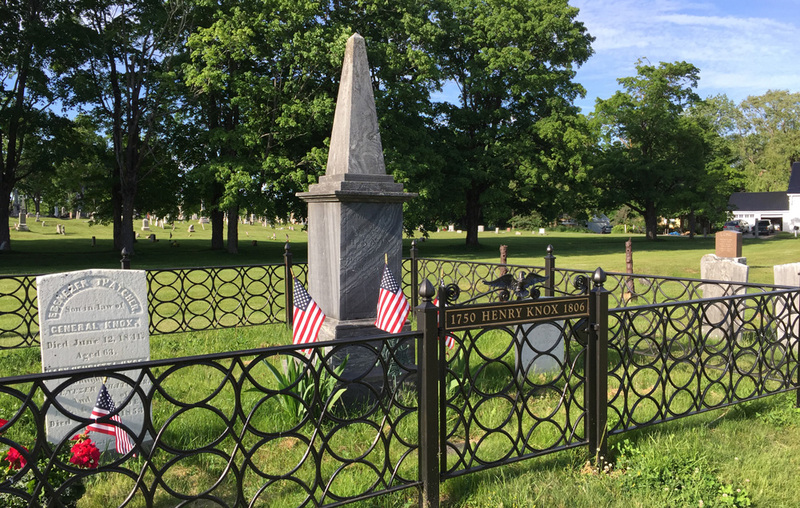 Graves and monument for Henry Knox and his family. 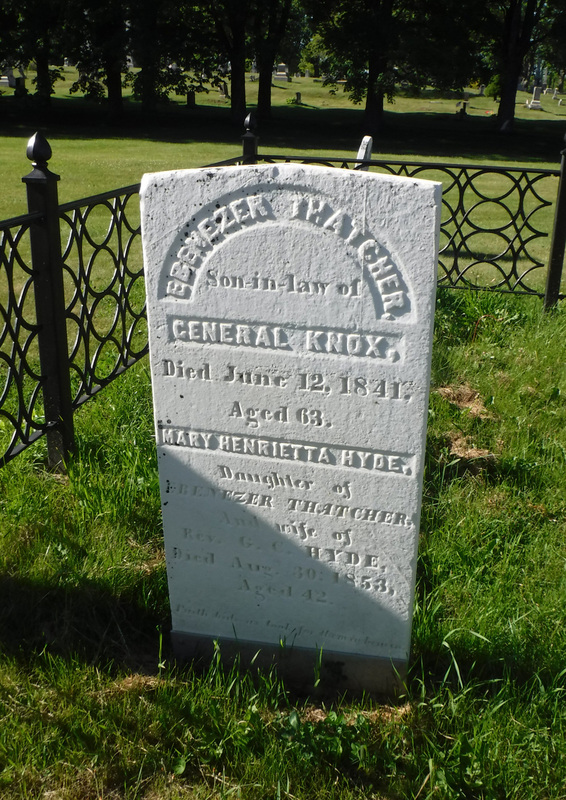 Henry’s daughter Lucy’s husband, Ebenezer Thatcher (my 4x great grandfather) has his own stone with one of Lucy’s daughters, Mary Henrietta (who married a Hyde). My 4x-great-grandfather Ebenezer Thatcher’s gravestone. Thanks so much to Director Matt Hansbury, the museum’s board and docents Sarah, Lindsay, and Bailey. Lindsay also helped with the video. And thanks to my friend Jane Dimitry for trekking the three hours each way from Boston to join me. Added attractions for the weekend were lobster rolls at McLoons in Rockland. Cousin Haven outside McLoon’s restaurant in Rockland. 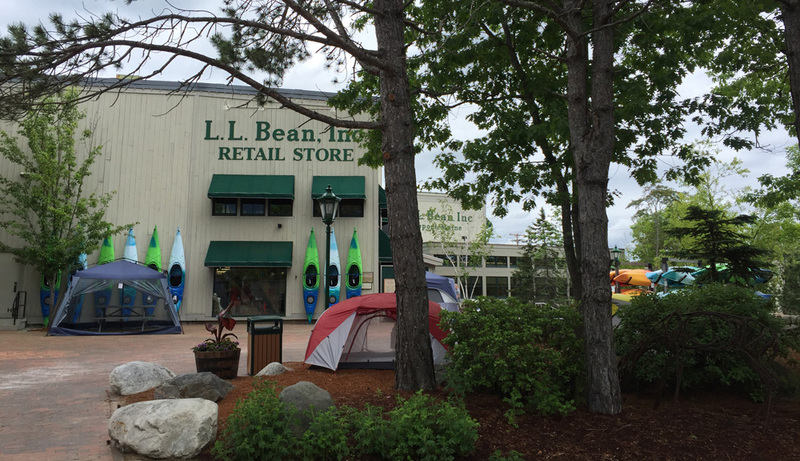 And on the route between Boston and Thomaston, I stopped to shop at my favorite store, LLBean. 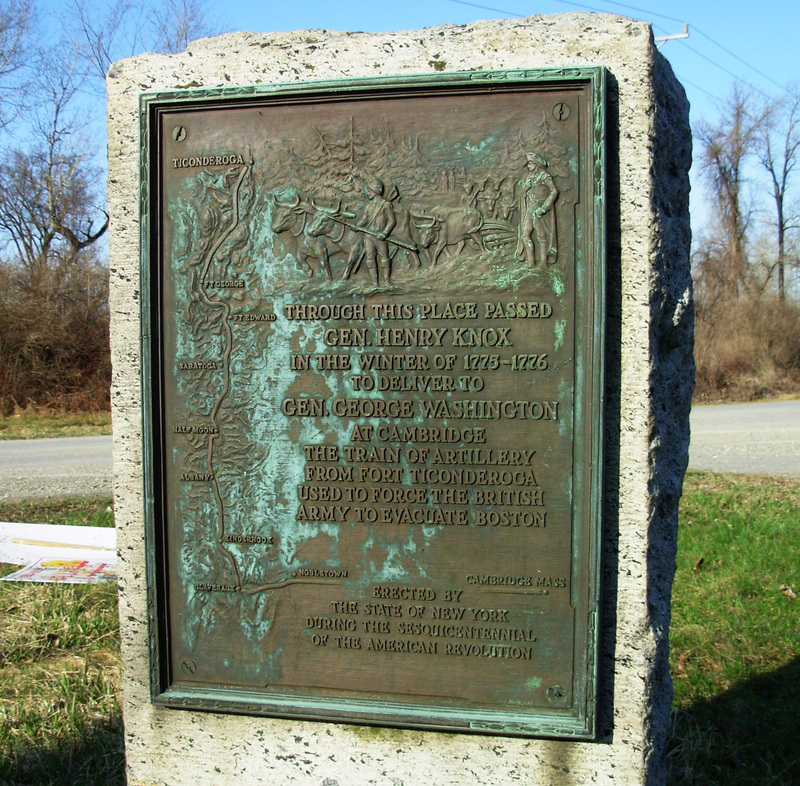 I first learned about these markers when I was researching Henry Knox in 2007. My corgi, Annie, and I were on a road trip circling the US in a BMW 3-series station wagon. We spent nights in Motel-6es – they love dogs – or with my relatives. I had just learned I might be Henry’s greatx5 granddaughter and wanted to take a look-see at Fort Ticonderoga. But I was traveling in April and the museum was still closed. 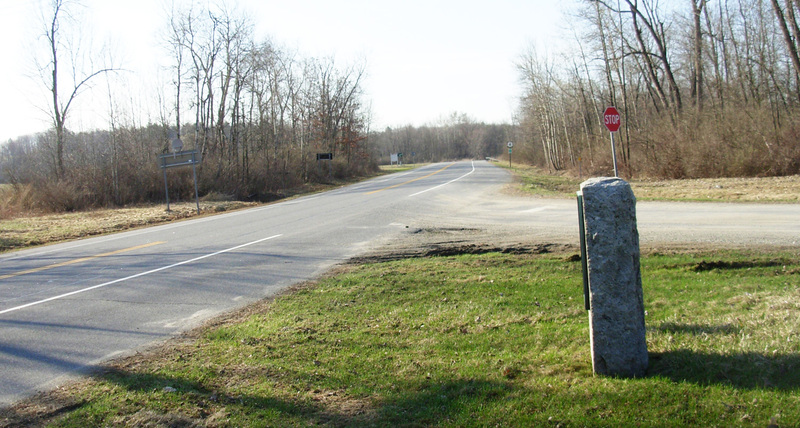 I did, however, pass this marker as I traveled north alongside the Hudson River (the same marker that I show above). Then I wrote an illustrated, sing-along children’s book to teach my grandchildren about Henry’s expedition. It’s called Henry’s Big Kaboom. This Thursday, I am traveling from my home in Northern California to New England to attend two book signings. In between the book signings, I will follow the Henry Knox Trail. 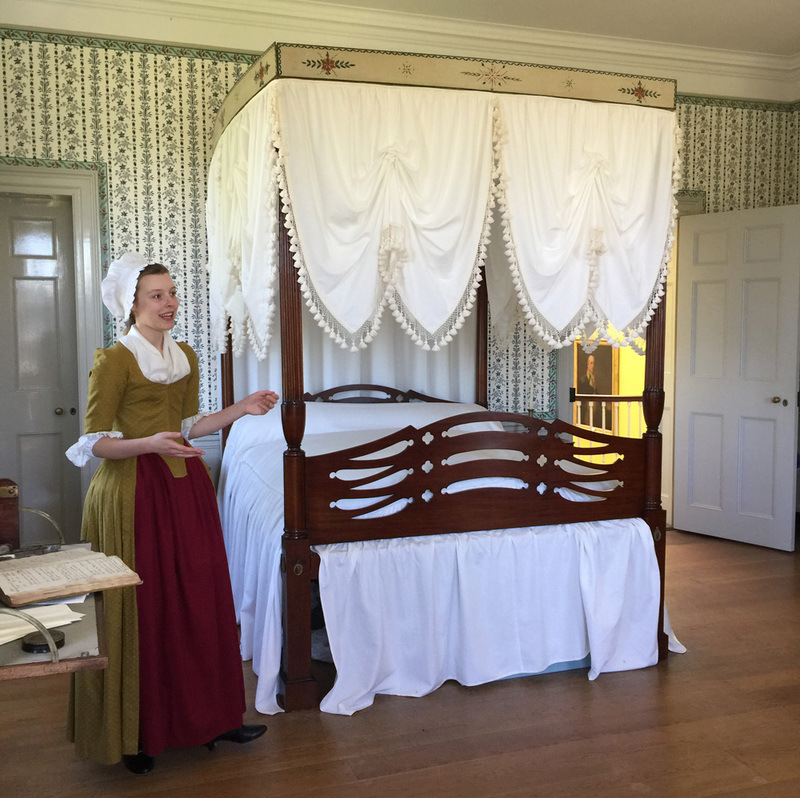 On Sunday afternoon, June 10, I will be at Fort Ticonderoga. I am so excited to finally see the fort. I will be sitting by one of the cannon Henry transported. The following Saturday, June 16, at 10:00, I will be signing more books at the Henry Knox Museum in Thomaston Maine. They are holding an event honoring the Society of the Cincinnati that Henry helped found. The event is titled “Boom.” It will be one big “Boom” weekend. Henry and his wife Lucy had thirteen children, but only three lived to adulthood. Only one of those three, Lucy Flucker Knox, left descendants. In other words, there are no descendants with a direct male line or with the last name Knox. Our line was a sticky thing to prove because Henry’s granddaughter Lucy got pregnant with my great-grandfather Charles when she was not married. The Knox family and Lucy’s father’s family, the Thatchers, tried to keep Lucy’s pregnancy a secret. Lucy married later, but her husband never found out about her affair. Charles met his mother once. The tender letter in which he describes this meeting is part of a document I have on my website that explains this whole ordeal. After Lucy and her husband died in 1863, Charles tried to contact the Knox and Thatcher families to find out who his father was. They did not cooperate. A cousin led him to believe that his father was a sailor who perished at sea two years after the affair. It turns out there was no such man. Lo and behold, as a result of seeking genealogical roots through DNA tests, a man named Burt Williams in Kentucky came up with a ‘zero distance’ match to my third cousin-once-removed Peter Lesley Ames who lived part-time in Venezuela and part-time in Florida. My great-grandfather Charles Gordon Ames (he took the last name of the people who adopted him in 1830) has 250± living descendants, but only Peter and his son Charles Gordon Ames the Second have a direct male line to CGA the First. Peter passed away this year, but we still have Charlie, who lives in Louisville, Kentucky. As a result of this genealogical work, I updated a family tree that includes all 250± of Charles Gordon Ames’ living descendant by his two wives. Through emails, I met my third cousin Amy MacDonald (she is one week older than I am) living in Maine not too far from the Knox Museum. She also writes picture books for children. We have joined forces. She will be there on the 16th with her books, too. I can’t wait to meet her. 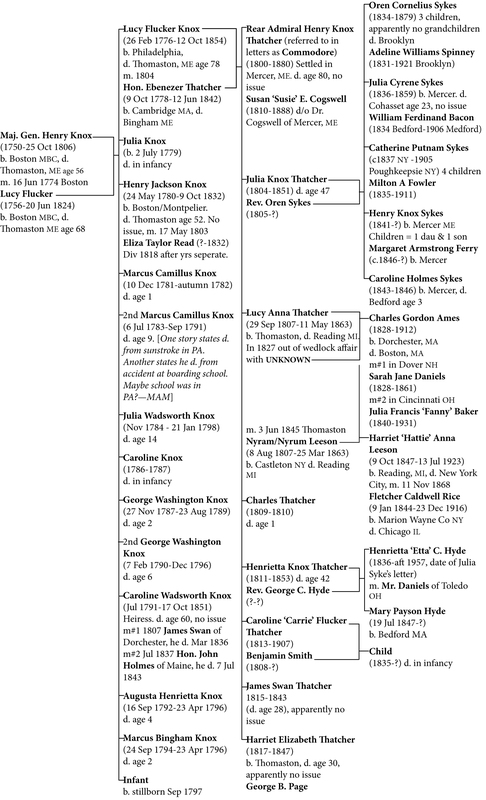 Here is Henry Knox’s family tree through the first three generations.